Film from Brian Lockey of Luton who recorded so many of the events around the Midland Main Line from 1958 onwards with the accent on Luton Midland and Bute Street, from Napsbury to Sharnbrook before steam finished on this busy route into the capital. Early railtours over closed branches and secondary lines are included with sometimes quite unusual motive power such as both tours with J52 No.1247 in the early sixties to Hertford and over the Hatfield to Luton Line. A journey around Midland and London & North-Western lines centred on Luton is the main theme of this video with all the usual LMS types associated with the area included such as Jubilee, Royal Scot, 4F, 2P, Fowler and Stanier tanks, 9F, Black 5, Super D, 8F and Standards, Northampton to Olney and Bedford locals, Wellingborough and excursion traffic at Luton (just look at those headboards). The Hemel Hempstead and Higham Ferrers branches preclude a visit to Derby Works and the “Farewell to Midland” steam tour of June 1968 with “Oliver Cromwell” to Manchester brings to an end another fascinating insight into a long vanished scene. This film starts in Scotland with a visits to St.Margarets and Dundee sheds featuring V2, B1, J37 and A2 60532 “Blue Peter’’ among others. Returning to Glasgow Centrall we follow Standard Class 3MT 77005 on a brake van tour around Holytown and Motherwell in 1965. Southwards to Stoke-on-Trent for an exhibition of locomotives there in 1960, followed by film of Kidsgrove and the WCML between Stafford and Whitmore featuring Crab, Patriot and Super D locos. Then to the Peak District for a look at the Buxton to Millers Dale auto train, lineside and on train journey with LMS tanks 58083 and 41905. 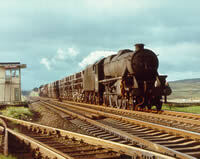 Over the Irish Sea we find ex-LMS NCC division 2-6-4Ts at work on the spoil trains from Belfast in 1968 with a visit to York Road depot included. Now south through Dundalk to Athlone and beyond with a railtour with run pasts in the Emerald Isle. 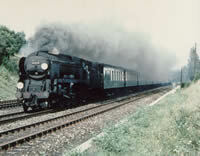 Jeep No.4 and CIE 0-6-0 No.186 star in this 2-day railtour. Back to England, we cover the Midland Ltd tour of 1962 from Marylebone to Derby via Nottingham behind ex-LNER B16 61438 and then utilising a Johnson 3F and the last “Pom-Pom’’ in service, No. 64354. A visit to Derby shed is included with views of Patriot 45543 “Home Guard’’ which hauled this tour on its last leg to St.Pancras. The “Banburian’’ tour from Luton Bute Street to Banbury Merton Street via Dunstable with Super D 48930 in 1962 precludes scenes at Banbury in 1966. Then travelling onto Woodford Halse to join GWR engines 2246 and 6388 on a tour via Worcester, Birmingham and on to Cheltenham viewing 45552 “Silver Jubilee’’ and Castle 7005 “Sir Edward Elgar’’. The film ends with a return to Scotland via Carlisle where we see A4, Britannia and Jubilee locos and scenes of the Jones Goods on a tour around Glasgow and GNSR No.49 with Caledonian Single No.123 at Glasgow Central in 1965. Much of this film was shot by Bob Todd and Tony Powell who contributed much to Volumes 23 and 25, all excellent material. Cover photo: Dave Mills. A2 60530 “Sayajiro”. If you want steam in its last glorious year then this production will delight. No, not 1967, but 1964 when so many loved classes went from the scene. The film taken so well by Bob Todd and seen by many at railway meetings around the country will interest many who mourn the loss of steam traction. Bob used an all lines railrover to visit such locations as Paddington for Panniers, 61xx and Castle classes, even a condensing pannier tank. 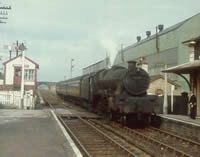 Exeter for four engines on the Meldon Quarry stone train, Wadebridge for 1366 class and the North Cornwall line to Okehampton. Yeovil for 6430 and push-pull working to Sherborne and a railtour to Hereford with 5054 preclude a visit to the Cromford and High Peak line with ex-LMS 47006. On via York with B16, 04, WD to Scotland. 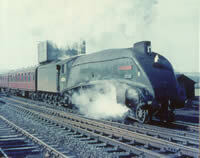 Thornton Junction had B1, V2, J38 and J37. Six different A4s are seen at Aberdeen, Perth and Stirling along with three Princess Coronation Pacifics in their last working week, green and maroon. 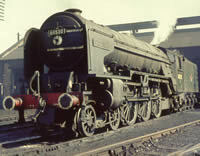 Britannia 70035 puts in an appearance with Jubilee, Standard Class 5s and ex-LMS Black 5s. Bob’s failed DMU is rescued by a B1. 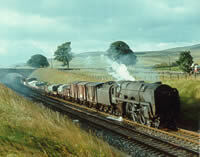 The film ends with a journey to Carlisle with now preserved 70013 ‘‘Oliver Cromwell’’. 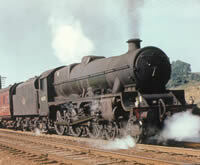 With nearly 90 different engines of 30 classes this is a superb compilation of 1964. Cover photo: Dave Mills. A4 at Stonehaven. The main section of the programme features steam in Shropshire & the Welsh Border Branch Lines in the early 60s, and even a rare shot from 1929 on the Bishop Castle Railway: also the last days on the Colonel Stephen’s Railway & the Clee Hill Quarry Branch. The final 20 mins. 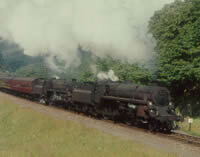 of the programme feature a Cambrian Requiem and the return of steam specials to Shropshire in 1972. The early sixties saw Barry Eagles roaming the rails south and west to record the last workings of steam in the South Wales coalfields with 72xx, 56xx, Panniers, Granges and Halls. Journeying via Gloucester, Yeovil and Templecombe we arrive at Southampton Docks where USA tanks worked the wharves and even 3440 “City of Truro” paid a visit. We visit the Isle-of-Wight for the 02 class, Hayling Island for Terriers, Ashford for C class and the ex-LSWR main line from Basingstoke to Weymouth for Bulleids, Standards, S15, Moguls, M7, B4 and the ex-GWR Halls on the Bournemouth to Birkenhead working. 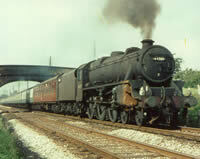 Salisbury, Fawley, Lymington and the Swanage branch are also featured. 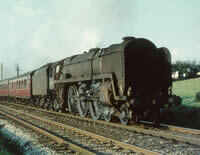 The last main line steam on BR bowed out in August 1968 in the North-West. The West Coast Main Line between Crewe and Carlisle became a mecca for enthusiasts in these latter days and George Woods and Colin White have combined their film of the period to produce this video of what it was really like at the last with particular reference to the section between Grayrigg and Shap Summit. We take the viewer on an imaginary journey from Crewe to Shap with lineside views of the principle locations which include Warrington, Wigan, Preston, Garstang, Hest Bank, Carnforth and Tebay. Five locomotive depots are visited to see the engines being serviced. There are some unusual workings to be seen and views of Hest Bank and Dillicar water troughs in some detail. Shap Incline is well covered where locomotives worked particularly hard and a footplate ride on one of the bankers is included. There are eleven different Britannias, ex-LMS Black 5s and 8Fs, Ivatts and Standards including 9Fs and a Jubilee all filmed between 1966 and 1968. The men who worked the line are included showing their problems with run-down engines but game to the last to show what steam could do. No modern day footage has been included in this 60-minute production and the sounds you hear are generally recorded at the time of filming.